Late into the night in several major cities across the country, protesters took to the streets demanding justice for Trayvon Martin. The demonstrations were mostly peaceful, but did bring traffic to a standstill in several locations. NBC's Kerry Sanders reports. 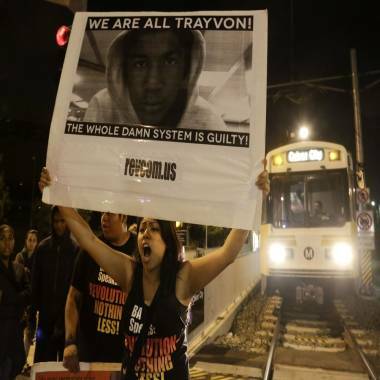 Rallies in support of Trayvon Martin grew in size and intensity Sunday night as protesters in some of America’s largest cities continued demonstrating their anger at the acquittal of George Zimmerman. In Los Angeles, protesters marched onto Interstate 10, shutting down the freeway for nearly an hour, NBC Los Angeles reported. The LA Police Department told NBC News that one arrest has been made during a demonstration after protesters threw rocks at police. LAPD commander Andrew Smith told NBC Los Angeles that officers fired bean bags at some protesters who threw objects at law enforcement. In New York City, thousands of demonstrators marched from Union Square to the tourist-heavy Times Square Sunday night, slowing and in some cases halting traffic. A protester in support of Trayvon Martin in Los Angeles after the acquittal of George Zimmerman late Saturday. WNBC reported the area was gridlocked with people holding signs in support of Martin and calling Zimmerman’s acquittal a failure of the judicial system. Police reported about 10 arrests for disorderly conduct as at 5 a.m. ET, according to WNBC. Some in the crowd said they were still in shock over the verdict. “I’ve been speechless all night, I couldn’t sleep,” said Kelly Knight, a Brooklyn resident who came for the protest. “I have a young daughter, and I thought, if it happened to him, it could happen to her,” she said. In the Florida state capital of Tallahassee on Sunday, roughly 200 protesters, some wearing hoodies, sang songs of justice and carried signs that said "Racism is Not Dead." After the verdict on Saturday night, in San Francisco about 200 people marched down Mission Street carrying yellow signs that said “the whole system is racist” and “the people say guilty,” NBCBayArea.com reported. That march dispersed peacefully a little after 10 p.m. local time (1 a.m. ET), but a similar protest in downtown Oakland ended with numerous buildings and cars being vandalized and protesters setting random fires, NBCBayArea.com reported. There were no reports of injuries or arrests, authorities said. The verdict also sparked protests in Los Angeles, where police said about 200 demonstrators gathered Saturday in Leimert Park, the AP said. The Sacramento Bee reported that protesters in the California capital chanted: "What do we want? Justice. When do you we want it? Now. For who? Trayvon." Though expressions of outrage dominated Sunday’s rallies, many religious leaders used morning services to help begin the healing process following the contentious legal battle. In New York City, Rev. Jacqueline Lewis wore a pink hoodie during Sunday morning services at Middle Collegiate Church. She told her congregation to conduct themselves in the peaceful way Martin Luther King Jr. would have wanted and prayed for both Martin and Zimmerman. “We’re going to pray, and we’re also going to continue to organize, which is what we do,” she told reporters before church services.